Before I check out of the hotel, I’m headed down to “Naka-u” for my last meal in Kyoto… and who cares about a reprieve from the governor when you’re chowing down on the best udon soup ever created! Dropped my keys off at the lobby desk, walked out the door, walked straight into a taxi (with automatic doors of course) and I’m entering Shinkansen ticketing within 15 minutes. Total faire for the cab ride was only Y800. Purchased a “reserved regular” Shinkansen ticket to Tokyo but the train leaves the station in only five minutes! I’m rushing to the upper level Shinkansen platforms where my train awaits … only to be greeted by a closing door. I watch forlorned as my Y1520 Shinkansen ticket pulls out of the station. Yes, I have just missed my train! Missed my train by mere seconds! Hand it to the Japanese, they keep those trains running on time, no matter what. I ask one of the JR platform attendants what to do and he dismisses this as a non-problem, just queue up to car 3, 4 or 5 of the next train and take an unreserved seat. That seems like a fair compromise. I wait for the next Nozomi Shinkansen and it does have a few empty, unreserved seats (although not many). I now have a seat on a Nozomi bulet train to Tokyo. Aside from the linoleum flooring that graces the unreserved seating cars, and the ability to choose a specific seat, I see little or no difference between unreserved and reserved seating. Choice and different flooring is what a Y5500 reserved seat fee buys you. If you desire a window seat because you like to photograph the landscape whizzing passed, you take your chances with unreserved seating, its first come first serve and this time I lost out on the window seat… no scenery photography. In my future travels I think I’ll try unreserved seating again, especially at off-peak times. Something similar happened to me five years ago when I wanted a Shinkansen ticket from Kansai area to Tokyo and my JR Pass had expired. The only recourse was to purchase a ticket with cash but there were no reserved or green car seats available. Yup, I had to sit in the unreserved car with drunken businessmen and the linoleum floors. I just noticed the convenient flip down hooks at each seat, for hanging your umbrella or jacket, how clever! And a few minutes later we roll into Tokyo Station. Disembarking, I recognize the platform immediately as the platform I photographed five years ago on my last Shinkansen journey to Kyoto. I deliberately make my way, to the Marunouchi South Exit and the new Tokyo Station renovations. Wow, the dome interior looks great! And the exterior rebuild is something else, like stepping back into the 1920’s! I step outside and almost directly into a taxi with automatic doors. 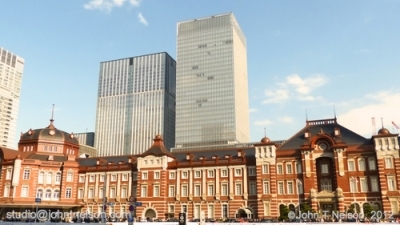 Tokyo Station is actually quite close to my destination, across the Sumidagawa in Monzen Nakacho. Now we shall find out how much convenience costs. I’ve hoofed it through the Tokyo Metro system with luggage before and it is not a pretty sight. Door to door taxi service is far preferable! We cross the Eitaibashi and look look look at Sky Tree over the Sumidagawa! The taxi arrives at the hotel and I pay only Y1430, very reasonable considering the alternatives. This hotel is really just a temporary place to sleep before I can pick up the keys to the apartment, where I’ll be living for the next month. The apartment is just 100 feet away from the hotel, making the transition a snap. I’m a few hours early for checkin, so I check my luggage in the lobby and wander around the neighborhood a bit. Yes, as I suspected the Sunkus has been replaced by a Lawson’s. It;s a strange feeling returning to this neighborhood after five years… and I never in my life imagined that I would be staying at this hotel which I’ve walked passed so many times before. I found Sky Tree and man is it impressive! Very picturesque with the Mifune Bashi Bridge in the foreground. The fact that you can see it looming in the sky from this distance is impressive enough. I check into my hotel room in Tokyo and it’s so small the door to the room, opens into the hallway… now that’s a closet!